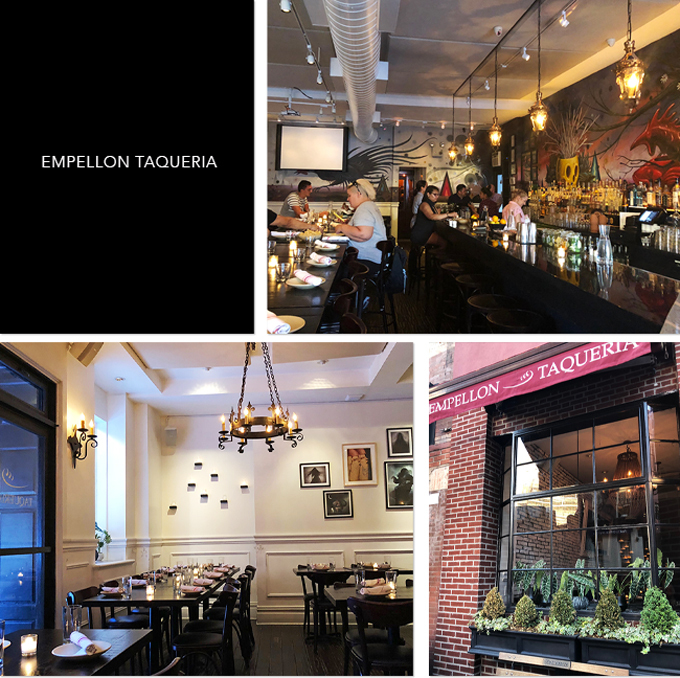 Empellon Taqueria is the Greenwich Village faction of Alex Stupak's Mexican-inspired empire. The focus and draw of this space are the inventive tacos which the former pastry chef has come to be known for. The menu also features an array of snacks and large plates for sharing. Located on West 4th just south of Seventh Avenue, the buzzy taqueria opens up to a lively dining room with a bar on one side. There is another dining room with a traditional design located in the back. We were seated there and it had a pleasantly quiet atmosphere. We started our meal with guacamole with two salsas. The guacamole was slightly chunky and flavorful. It also contained a generous amount of cilantro and a slow heat which I didn't mind. Of the smoked cashew and arbol salsas, I preferred the smoked cashew for it's rich, smokey flavor and creamy texture over the arbol which was just spicy. 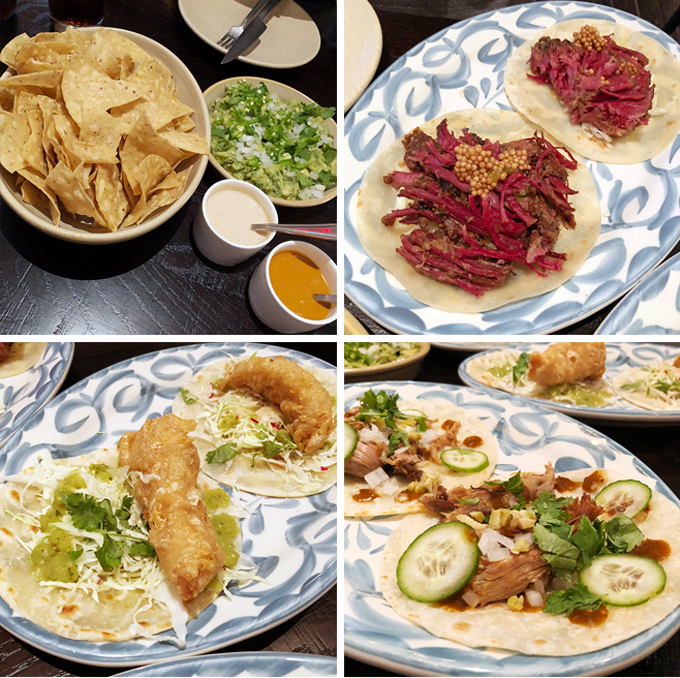 We also tried a selection of their tacos including Empellon's famous pastrami tacos. Served on soft corn tortillas, the pastrami is topped with pickled cabbage and mustard seed salsa. They were tasty if a touch salty. Though a tried and true flavor combination we agreed that we prefer Katz's traditional pastrami on rye more. The fish tempura tacos with cabbage and lime mayonnaise were our favorite. They were a little skimpy but the crunchy, flaky fish was delicious. The smoky lamb barbacoa tacos with cucumber and salsa borracha which lacked both in flavor and texture were disappointing. The service was friendly and professional. The food was served in a timely fashion but it was just okay. The quality and portions don't justify the high prices. Our meal with tax and tip was almost $100 and we didn't even have alcohol. We don't mind paying for good food but the value just wasn't there in this case. The food sounds and more importantly looks so good. Nothing beats a restaurant that serves food in a timely manner. Sad that you didn't get the value for your money. The food sounds delicious, and of course your pictures are very appetizing, but it is indeed quite pricey, so the food really has to convince to justify the price point. Gosh! That price is insane considering how cheap authentic Mexican food is, but hey...it's NYC. The food does look pretty awesome, chingu:) Those fish tempura tacos....nomnom! It looks yummy, but it's a shame that the quality didn't live up to the price for you! The food looks delicious! It's too bad it was a little pricey for it being just okay. You sure find the best places to enjoy a meal. This restaurant menu looks amazing a place I will enjoy. I'm sorry to hear that you weren't wowed by their food. We had a similar experience at Danji last Saturday. They recently started serving brunch but it wasn't satisfying at all especially considering the money we spent (just in case you're interested in trying). Seems like you didn't have such a great time at Empellon Taqueria...sorry to hear that the quality of the dishes didn't justify the high price, well at least the service was friendly and the meals arrived on time. Thanks for reviewing this place. The fish tacos sound wonderful! It's too bad the rest of the dishes didn't justify the price. But they seemed pretty inventive though! Oh wow that is expensive, there is just too much to choose from in NY to pay for such high prices for average food. Pretty place though. Hello Rowena, everything looks so good and tasty, I like Mexican food, my favorites are the tacos and enchiladas, the place is great for dining out. Have a nice weekend hun! Oh my Gosh everything looks so yummy! It looks delicious! Sorry it didnt live up to how good it looks. How disappointing.